Discussion in 'Hawaii Fishing Reports' started by Startmeup, Apr 17, 2011. Aloha from Lahaina Harbor, Maui. Ursus Kapule, a local Hawaii resident from the island of Molokai, had a great fishing trip today with Start Me Up. Ursus got a huge bite while trolling one mile outside of LA buoy. An hour and ten minutes later, Ursus caught his 700.5 lb. blue marlin. In accordance with Start Me Up&#8217;s policy for fish over 500 lbs., Ursus&#8217;s trip was free and a 300 dollar donation will be made to a local charity. Congratulations to Ursus on catching the fish of a lifetime. The blue marlin bit a Bomboy lure running on the short corner. The fish immediately turned away from the boat and headed for the horizon, ripping out 800 yards of line. Once this initial run was over, Ursus was quick to gain back a couple hundred yards of line in less than a minute. The fact that Ursus was gaining line so quickly worried Captain Randy Evans, who thought that the marlin might have come off. Captain Randy throttled ahead and found that the fish was still on the line. Ursus managed to gain back a majority of the line within a half hour after the strike. Once the marlin was only about 150 yards away from the boat, the fish started swimming in slow clockwise circles. Not wanting to rush the fish, Captain Randy followed the line which Ursus was slowly able put back on the reel. The marlin continued to do slow clockwise circles until Ursus reach double line. At that point, the fish started to swim back and forth behind the boat in a zig-zag pattern. Crewman John French grabbed leader for the first time on the port corner but the marlin headed towards the starboard corner and John was forced to let go of the leader. During this first leader attempt, the fish started to tilt onto its side and everyone recognized this movement as an indicator of fatigue. John therefore decided not to release the leader on his next attempt to bring the fish to the side of the boat. John again grabbed leader on the port corner for his second leader attempt and immediately took a wrap below the swivel. He then took a double wrap with his right hand as the fish dove towards the propellers. John managed to turn the marlin around and the fish surfaced next to the boat. Captain Randy was immediately on the scene to gaff the fish and secure Ursus&#8217;s outstanding catch. Ursus caught his blue marlin on the way back to Lahaina Harbor and, once the fish was securely on the back deck, the boat made the approximately 13 mile trip back to the harbor so that the fish could be weighed. There was a general consensus that the fish would definitely tip the scales at over 500 lbs. The official weight turned out to be 700.5 lbs. Without a doubt, there will be a lot of smoked marlin to be consumed and enjoyed in the near future. Again, congratulations to Ursus on the fish of a lifetime. His 700.5 lb. blue marlin is truly a magnificent catch. Right on... great fish... great report. I admire your policy on the big fish - free ride - charity donation.. very cool. 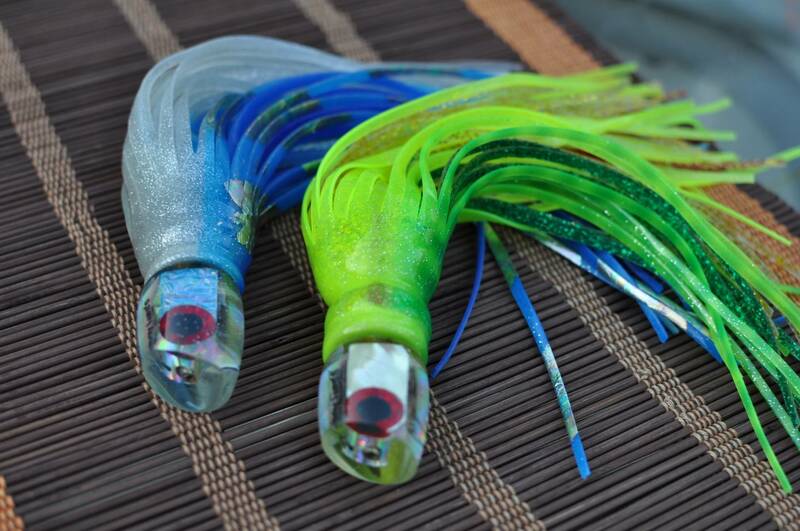 zanegler Bomboy Lures Are Money! That is a great policy. My-oh-my the angler must have been doubly excited. Can you share the exact details of which Bomboy the beast engulfed? What color? What position was it running? For extra credit, a picture of the lure would be awesome. It looks like a Supernut in the pic, but hard to tell..
One more question....have you pulled the mini-g? It is somethin' else. A lifetime fish and a story for your charter, way to go. She's a beaut. Bomboy personally has 14 over 700# on the Scarface, but I think the head is too long for a Scarface. Bomboy just called me and he is pretty sure it is the Magilla. If you look at the head it is almost as long as the 130 International is wide. Not sure what type of lure it is. I'll post when I get a chance to take a closer look at it.